Last year, China announced a ban on imports of ‘foreign garbage’. The result? Western stockpiles of used paper and plastic have reached crisis proportions. Adam Liebman explains why we need a less rosy notion of what actually happens to our recycling. Not long after the film premiered, the ‘good markets’ from China began to disappear as the Chinese government made moves to tighten restrictions on yang laji (‘foreign garbage’). This culminated in an announcement to the World Trade Organization in July 2017 that China would soon ban the import of 24 types of ‘solid waste’, including types of plastic and paper scrap that are end products of recycling programmes in Western countries. Despite appeals from scrap industry trade associations, the government strengthened the restrictions as it began fully implementing its new policies in 2018. Global commodity prices of many scrap materials have plummeted in response. Without demand from the Chinese market, much of the material collected as ‘recycling’ is piling up around the world with nowhere to go except landfills and incinerators. China’s ban on ‘foreign garbage’ has thus had a rupturing effect. It has ruptured trans-oceanic flows of scrap on which many recycling programmes in wealthier nations rely. More consequentially, it has also ruptured popular understandings of ‘recycling’ itself, by calling into question the differences between recycling and garbage. It has shed light on the messy business and hidden processes – rarely considered by well-meaning consumers sorting their paper from plastic – that turn waste into raw material for manufacturing. Waste reutilization is not novel. Humans have long found ways to make use of old and broken things. However, the contemporary notion of ‘recycling’ emerged from the 1960s and 1970s environmental movement in the United States. This movement was concerned with natural resource depletion and the environmental impact of waste, not with the economic value of waste that had long driven scrap industries. Early recycling campaigners targeted the companies that manufacture products with disposable packaging to take responsibility for post-consumer waste; but corporate interests successfully shifted the onus of recycling to consumers to make sure that recycling did not threaten their business models. As kerbside recycling programmes were established in the decades that followed, China’s economy was growing rapidly. Fuelled by a cheap and plenti­ful supply of labourers, China had become a major producer of consumer goods for the world market by the 1990s. However, Chinese factories did not have access to a similarly plentiful supply of the raw materials needed for manufacturing. Importing scrap emerged as an important means of procuring material feedstocks. By the first decade of the 21st century, China had become both the world’s centre of industrial production and the destination for much of the world’s recycling. During this time, recycling was made into the individualized practice that many Westerners know today. To ‘recycle’, as a verb, came to signify individual acts of placing waste in bins according to a given set of guidelines. Reinforced by advertising campaigns that emphasized individual responsibility, hid the industrial side of recycling, and referred only to vague environmental benefits, most of the people who followed such guidelines rarely understood much about the recycling process beyond collection. Few had any idea that a significant portion of the recyclables they carefully placed in designated bins were being sold to distant parts of the world. That is, few knew until China’s ‘foreign garbage’ ban became a news story in all affected countries: the US and European Union, as well as Japan, South Korea, Australia, New Zealand/Aotearoa, Canada, and others. 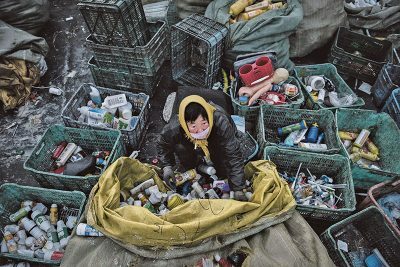 ‘China says it won’t take any more foreign garbage,’ reads a Reuters headline from 2017, while a story in The Economistis titled ‘China tries to keep foreign rubbish out: how a new rule could wallop the recycling industry.’ By adopting the term ‘foreign garbage’, these headlines invite readers to wonder how it is that their ‘recycling’ can appear as ‘garbage’ in China. Do the Chinese fail to see the environmental and economic benefits of recycling waste? Or do we fail to see the hazards and pollution involved in the industrial processing of recyclables? Some scrap trade associations have responded by condescendingly questioning whether the Chinese government understands the difference between waste and scrap. However, in a notice to the WTO addressing the concerns of other governments, Chinese officials correctly note that there is no ‘globally recognized standard for scrap materials and recyclable materials’, which is why they used internationally recognized commodity codes to list restricted materials. This echoes what many anti-foreign waste voices from China are saying: the categories of ‘garbage’ and ‘scrap’ are not mutually exclusive. Waste materials can be valuable and useful for manufacturing, but the processing needed to purify and prepare them for manufacturing can be very problematic. As critics of recycling have long pointed out, not only does the industrial processing of scrap materials generate environmental pollution, it also requires high expenditures of energy, needs additional raw material inputs, produces inferior products, and sends excess materials to the very landfills and incinerators meant to be avoided. In other words, while ‘recycling’ waste generates valuable materials for manufacturing, it also generates garbage and pollution. China’s efforts to ban imported scrap can be understood as an efficient way to deal with the pollution caused by the unregulated processing of scrap, by cutting off its route into the country. However, the rhetoric around ‘foreign garbage’ is also influenced by nationalist sentiment. The term is used by some in China to denounce a broader range of foreign things seen as threatening, from worthless foreigners to KFC. In certain contexts, the Chinese character yang(‘foreign’) denotes a specific kind of foreignness that is linked to past experiences with colonialism and imperialism. Further, as (at time of writing) the US-China trade war develops, scrap import restrictions have become embroiled in a much broader international power game. Despite the imbroglio, imported scrap is only a portion of the waste matter being processed and reused for manufacturing in China. Construction and demolition waste from domestic sources makes up a significant quantity, as does some industrial waste. The rise of a mass consuming middle class has also resulted in a proliferation of post-consumer waste. In all urban areas, there are dispersed armies of rural migrants who make a living collecting, sorting and trading the parts of this waste that are of value. Together they comprise an industry that is mostly unregulated and organized around kinship and native-place ties. Since this informal industry replaced state-run scrap companies in the 1990s, it has often been a target of ‘clean-up’ campaigns for reasons that go beyond environmental pollution, including the discriminatory treatment of rural migrants in general. Domestic informal scrap trading chains are flexible and efficient, but tend to generate end products that are less finely sorted and more contaminated than foreign scrap imports. However, instead of working to improve this system, the government has recently been handing out huge contracts to waste management companies (often well-connected to government officials) that deftly utilize environmentalist rhetoric. Current policies favour developing more infrastructure for waste incineration, which offers high profit margins. Incineration, compared to recycling, is even more complicit with disposability and at odds with waste reduction. It too emits dangerous pollutants and generates toxic solid waste that still must be disposed of somehow. This does not mean that there are no Chinese voices calling for ‘recycling’. In the past two decades, most major cities have seen campaigns to promote individualized ethics of recycling and install Western-style garbage sorting and recycling systems. These efforts have largely failed and there are many theories as to why. One common scapegoat is the general public, blamed for poor participation and lacking the education and refinement of Western counterparts. Yet perhaps the opposite problem is the case: Chinese people know too much. Perhaps efforts to bring ‘recycling’ to China are constrained by the fact that so much unregulated industrial processing of scrap occurs so close to home. Indeed, media exposés focused on crooked and polluting aspects of scrap industries are a common genre of investigative journalism in China. They impart an implicit message that placing garbage in one bin rather than another will not automatically protect the environment. Technology – a silver bullet? Of course, advanced technologies exist to process scrap in ways that reduce pollution and risks to workers. However, these systems tend to be costly and uncompetitive in a globalized market that often sends scrap wherever labour is cheap and environmental regulations absent. As China has implemented its ban, there have been reports of scrap imports increasing in scores of countries, from Vietnam to Poland. Altogether they still cannot make up for the loss of the Chinese market, and some are already imposing their own restrictions. Exporting countries are being forced to look at ways of boosting the processing of waste within their own borders. Many commentators see this as a promising development. Yet there is no silver bullet. China’s ban on ‘foreign garbage’ has brought a crisis to many recycling programmes around the world, but it also provides a much-needed provocation, forcing us to re-evaluate how we think about waste, the environment, responsibility, and power in relation to ‘recycling’.